The new Keflavik Airport master plan designed by Oslo-based Nordic Architecture centres on the optimisation of the airport’s existing facilities, and was selected by the gateway largely for its phased approach to expansion, which will enable it to operate unhindered by construction. When the expansion is completed in 2040 the airport will have the capacity to handle nine million passengers – double the number that it handles today. This year, Keflavik International Airport anticipates the arrival of nearly 1.2 million tourists – a 23% rise on last year – and the growth of Iceland’s booming tourism industry shows no sign of slowing. 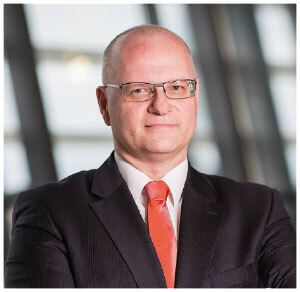 In response, the airport is embarking on its new master plan, which will facilitate growth of the airport’s capacity from 4.5 million passengers today to nine million by 2040, as Björn Óli Hauksson, Managing Director, Isavia, explained to Amy Hanna. The tourism industry in Iceland has in recent years flourished, as passengers flock to the Nordic island in unprecedented numbers to take in the natural beauty of the ‘The Land of Fire and Ice’ – called so because of its unique position as the home to some of the largest glaciers in Europe, and most active volcanoes in the world. Two spectacular volcanic eruptions have marked Iceland firmly on the map, and since 2010 the amount of international travellers visiting the country has doubled – a rise further bolstered by the efforts of the government, airlines and Isavia, operator of the nation’s primary gateway Keflavik International Airport – to promote Iceland as an unmissable touristic destination. The burgeoning tourism trade has played a pivotal role in the revival of the Icelandic economy, and has been the driving force behind roughly a third of economic growth and 45% of all new jobs created since 2010. The swelling number of tourists visiting Iceland forms a key component of Keflavik International Airport’s continued success, but has also begun to put strain on the airport’s capacity, and means that the airport’s existing master plan has been exhausted far earlier than expected. Investment is now needed to accommodate the increased demand for space and services, and open Icelandic skies to more competition between airlines, with the expansion of the Keflavik’s airfield and infrastructure. Last year Isavia held a design contest for the acquisition of a new master plan that would outline the long-term development plan for the airport from 2015 to 2040. It announced in February that Oslo-based Nordic Architecture was the winning company, and will create the plan that will facilitate growth of the airport’s capacity from 4.5 million passengers today to nine million at the end of the 25-year period. The new Keflavik Airport master plan centres on the optimisation of the airport’s existing facilities, and was selected, Hauksson explained, largely for its phased approach to expansion, which will allow the airport to operate unhindered by construction. According to the plan, while the terminal building will grow significantly, walking distances within the terminal will be minimised – a two-level traffic forecourt giving simpler access to a future terminal and arrival hall. A solidified strategy for the development of Keflavik’s airfield is also a key aspect of the new plan. “A third runway is proposed west of the terminal and parallel to the existing 02/20 runway, thus developing the terminal into a midfield terminal with added operational advantages in future planning,” Hauksson said. The master plan will be finalised in September of this year, while it is anticipated, Hauksson explained, that works on the expansion according to the plan will take place as need demands it, likely beginning in late-2016 to early-2017. “A phased expansion of the aprons to the east, a terminal expansion to the north and a northeast pier expansion are the first development projects proposed by Nordic,” he stated. “This development can partly take place landside which is cost-efficient and without challenging the current level of service.” The third runway is expected to be required by the end of the expansion period in around 2040. At present Keflavik has two crossed 10,000ft runways, and its new master plan proposes a third runway, to the west of the terminal and parallel to the existing 02/20 runway – developing the site into a midfield terminal with added operational advantages for future planning. The third runway is expected to be needed by the end of the period in around 2040, by which time it is also anticipated that provision of ample space for aircraft stands will see the number of total stands brought to 34. The airport has forecast that the number of travellers flying via Keflavik International will rise from 3.8 million in 2014 to 5.2 million in 2017, but already, Hauksson disclosed, passenger traffic for the first three months of 2015 has increased by 25% compared to the same period last year, as airlines too recognise the increased interest in Iceland as an extraordinary travel destination, and exercise enhanced promotional efforts which are bearing fruit. The growing throughput in the period leading up to the future major expansion of its terminal means that Keflavik Airport must be proactive in improvement and refurbishment, to ensure that it can continue to provide travellers with world-class services. More than €100 million will be invested in the airport between 2014 and 2016, focused on eliminating bottlenecks and upgrading passenger services, as well as providing crucial stand space, enabling airlines to expand their services. “We began in 2014 extending the southern part of the terminal to the west, and this will provide us with at least six new bussing gates – a decision taken to ensure that we could more rapidly provide for the demands of the airlines with more gates in the peak hours. We will have the two gates ready for this summer and we will finalise the rest next year,” Hauksson said. Last year the airport also doubled the capacity of the baggage handling system, while the extension of the arrivals lounge and the modernisation of the retail and food & beverage offering in the second-floor departures lounge are also underway. With its exponentially growing traffic and expansion to meet passenger demand, Keflavik International Airport is in an ideal position as the host of the 8th ACI EUROPE Regional Airports’ Conference & Exhibition, 18-20 May. Focusing on increasing the visibility of the important contribution that regional airports make to the connectivity of Europe, the mobility of its citizens and the economic performance of its communities, the conference underscores the vital role of regional airports within the aviation environment.